St. Savior’s Lauren Duggan, center, No. 3, scored her 1,000th point on Feb. 5. The school presented her with a commemorative banner. Each year as the GCHSAA basketball season comes to a close, a number of senior players reach the 1,000-point plateau. It’s quite an achievement, and these players are thrilled to etch their names into their schools’ record books. But for one player at St. Saviour H.S., Park Slope, waiting around for her senior year was never an option. She joins Anucha Browne, ’81; Karen Erving, ’87; Jenn Hamilton, ’89; Patrice Erving, ’91; and Sue Radday, ’93, as the only 1,000-point scorers in school history. Duggan’s journey to 1,000 began on Catholic Youth Organization teams at the family’s parish, Blessed Trinity, Breezy Point. She also played soccer and swam, but basketball soon became the 16-year-old’s passion. She began playing Amateur Athletic Union basketball in fifth grade, and she continues today, playing for the New York City Heat. At St. Saviour, Duggan has been a member of the varsity team since she entered as a freshman. During her first two seasons, Duggan scored a total of 612 points, so with another strong showing this season, the 1,000-point milestone would certainly be coming into play. She averaged 25.8 points per game this season – and keep in mind, that’s in eight-minute quarters – so it was just a matter of time before she arrived at 1,000. Heading into the last home game, she needed 35 points to reach 1,000, so it would have taken quite the effort to get there. She turned in a solid first-half performance with 12 points, but a 16-point third quarter instantly put the milestone within reach. Meanwhile, Duggan just kept playing and didn’t worry about any records. However, based on the crowd’s reaction every time she shot the ball, she began to notice that she had to be closing in on something special. As the fourth quarter began, Gregson checked in with Duggan’s father, Brian, who keeps the statistics at the Pandas’ games. Brian said Lauren only had seven points to go, so Gregson started to sense the excitement in the gymnasium. In his six seasons as head coach, he had never coached a 1,000-point scorer. After making a few baskets to start the quarter, Duggan was fouled and headed to the free-throw line for two shots – thinking these would be just typical free-throws. But they wound up being far from typical. It turns out the first made free-throw actually was her 1,000th career point. The referees stopped the game so that the team could congratulate her. The school presented her with a banner recognizing the achievement, and her teammates all ran to hug her. 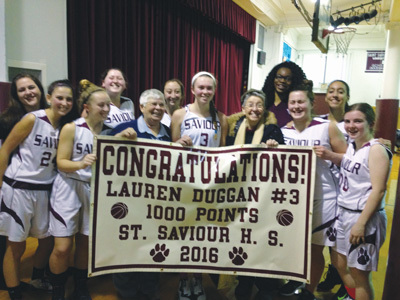 She had needed 35 points in the final game, and not only did she get all St. Savior’s Lauren Duggan, center, No. 3, scored her 1,000th point on Feb. 5. The school presented her with a commemorative banner. She also added two more points for good measure to finish the game with 37. “It’s pretty cool,” Duggan said of being the only junior in school history to reach the mark. “I know that before me St. Saviour had a lot of strong players so that adds to it. Gregson added that what’s more impressive even than scoring 1,000 points in three seasons is the fact that she did it while frequently facing double-teams or being guarded by an opposing team’s best defender. As this season comes to an end, the outlook for the St. Saviour team is bright heading into next season. The squad is currently comprised of mostly juniors, including Duggan, so they all have the necessary experience to now return as seniors poised to make a deep playoff run. As for Duggan, the excitement of reaching 1,000 points won’t be wearing off any time soon. But if her first three years are any indicator, she will simply focus of helping her team in any way possible her senior year.